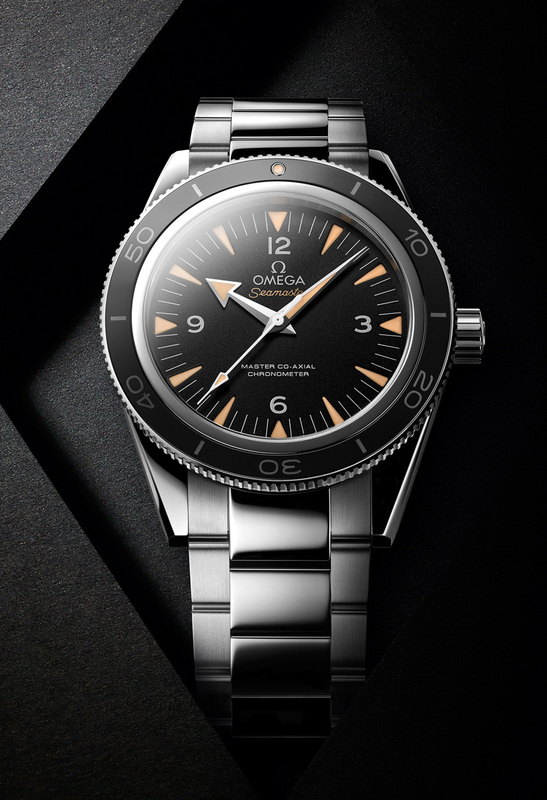 Omega has just unveiled a reissue of the Seamaster 300, its first modern dive watch. 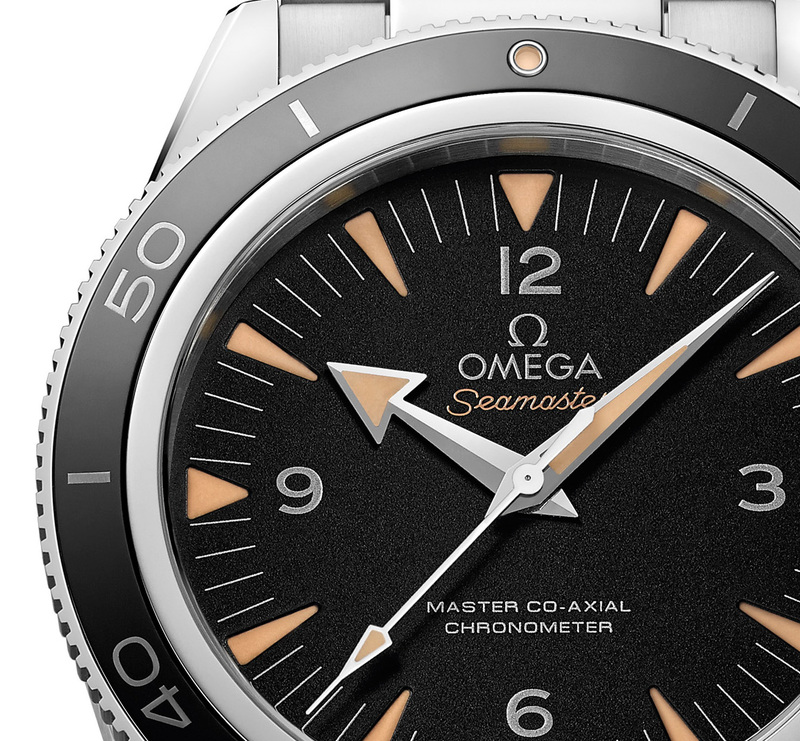 Faithful to the fifties original in style, the new Seamaster 300 Master Co-Axial has all the latest in Omega innovations, including a anti-magnetic movement as well as a ceramic bezel and dial. 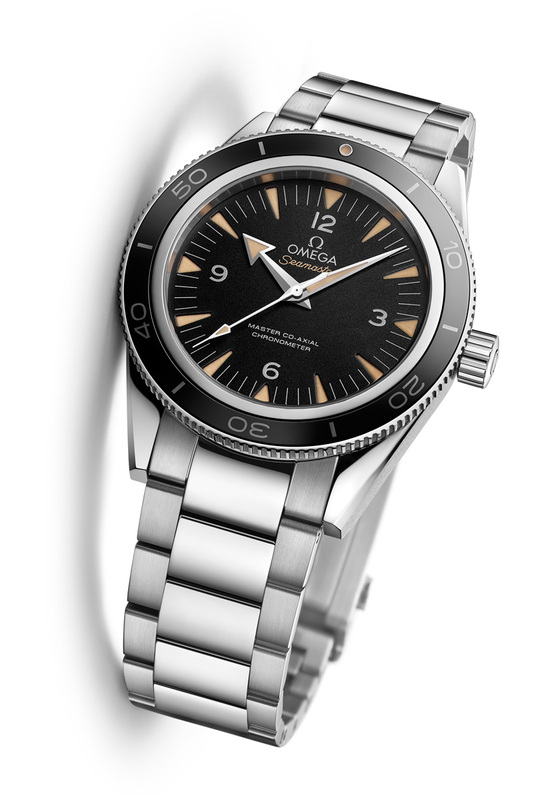 In 1957 Omega presented the Seamaster 300 CK2913, its first professional dive watch and one collectors regard as a true classic. 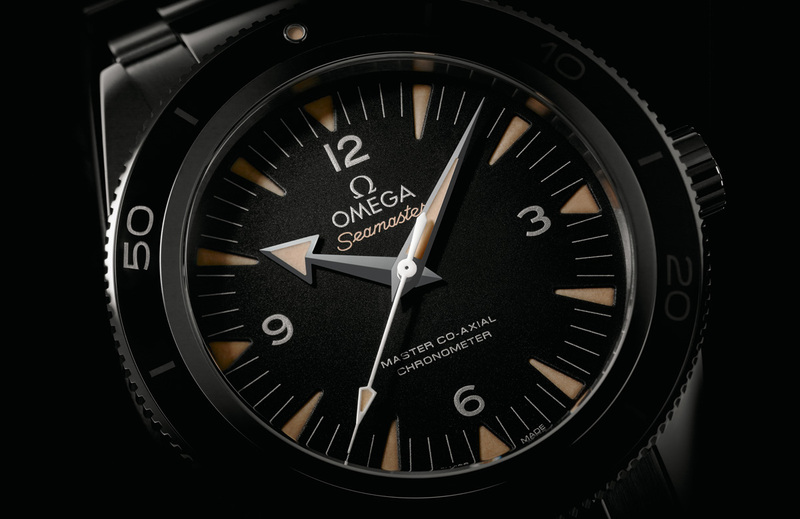 Omega has remade – and re-engineered – that classic and presented it at Baselworld 2014 as the Seamaster 300 Master Co-Axial. The new Seamaster 300 is not just an aesthetic exercise in revisiting the past. Though it sticks to the classic design of the original, including the straight lugs, arrow hands and Arabic numerals, it is equipped with the newest in Omega watchmaking. Rated to 300 m and 41 mm in diameter, the Seamaster 300 is equipped with the Master Co-Axial calibre 8400/8401, part of the Master Co-Axial range of movements unveiled at Baselworld (the 8400 is used in the steel and titanium models, while the 8401 is reserved for precious metal watches). All the Master Co-Axial movements are not merely shielded from magnetism, instead the movement itself is non-magnetic. That is all because of a Si14 silicon hairspring and the proprietary alloys used for various parts of the escapement, features were first seen in last year’s Aqua Terra >15,000 Gauss. This means the Master Co-Axial movements are resistant to magnetic fields of over 15,000 Gauss, a watchmaking record. By comparison, the Rolex Milgauss resists magnetic fields of up to 1000 Gauss. Because the movement is non-magnetic and needs no shielding, the Master Co-Axial calibre 8400/8401 is visible through a sapphire case back. It has twin barrels and a 60 hour power reserve. Additionally, the Seamaster 300 has a ceramic dial with white gold indices and hands. Similarly, the bezel has a ceramic insert with engraved markers deposited with metal. And the bracelet includes the patented rack-and-pusher clasp. Pressing a button on the clasp unlocks an extension, adjustable in six steps, which allows the bracelet to fit over a wetsuit. 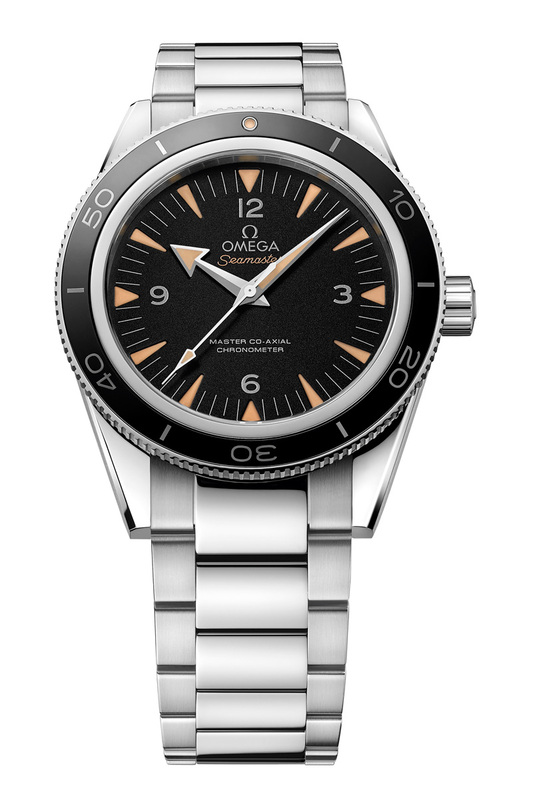 The Seamaster 300 is available in a wide variety of materials, starting with the basic steel model with a black dial and bezel (pictured here), as well as a titanium and blue model. Then there are two-tone versions in steel or titanium with fade-proof Seda rose gold accents. And at the top of the range are models entirely in Sedna gold or platinum. Pricing in Singapore dollars with 7% tax starts at S$8,550 (~US$6780) for the steel and S$11,650 (~US$9240) for the titanium. The two-tone in steel and gold is S$16,300 (~US$12,900), while the titanium and gold is S$19,400 (~US$15,400). No prices for the all gold or platinum versions are available yet, but expect them to cost at least double the two-tone models.